Brand New Show – mid-Season Area Appreciation Tues 22nd to Sat 26th July….2 p.m. show. All Branson (Tri-Lake) area residents are invited to see Jon England’s “Royally Entertained” music show at the Caravelle Theatre (next to Jim Stafford’s!) to receive his warm and sincere thanks for their welcome to this special city. A gorgeously featured, jam-packed 2 hour spectacular complete with a uniquely world famous “Royal” icon set against a backdrop direct from Hollywood’s Golden Age; every melody a multi-million seller; every costume change a glitzy tribute to Liberace’s Las Vegas nights…. Jon dazzles and tickles every ivory on THREE pianos which decorate the stage-set like so many diamonds on a moonlight lake. 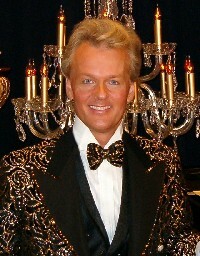 Charming, disarming, warm and emotionally engaging – this International Piano Entertainer direct from London, England will have you tapping your toes, humming along and leaving you keen to share the news about this great new show with everyone you meet….friends, family, out-of-towners and all fellow Bransonians! $5 each at the Caravelle box-office along with proof of Tri-County residency. Tuesday 22nd to Saturday 26th at 2 p.m.
Beginning Saturday, August 2, 2008, and continuing on the 1st Saturday of each month, businesses and galleries in Downtown Branson will host an Art Stroll from 4pm until 9pm. Visit the participating stores, pick up a map and enjoy an evening stroll viewing the art of local and area artists. Participating stores will display a poster.